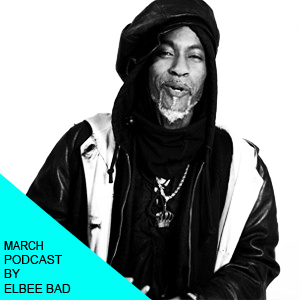 eLBee BaD is well known for being the Prince of Dance Music, and with March’s podcast “Ya Mama’s Tech Mixxx”, he reminds us of another part of his musical personality: intricate hectic TECHNO. Busy times lie ahead for this DJ who likes to enforce the power of his house music with the real strings of his friends from the POD Orchestra. Techno and house vinyl packed in his suitcase, eLBee will head out to see more of the world in the early spring: Germany, Belgium, Estonia, France, surfing on radio waves, and once again back to Berlin’s Boiler Room… Your Mom is very excited and hopes to see all you kids here or there. Previous March on March 2nd. Next Eric D. Clark joins the family!